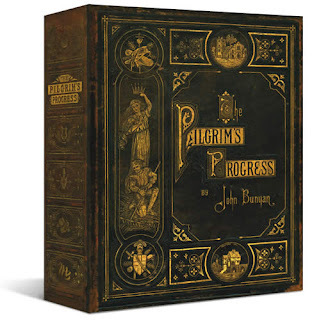 It's been a very long time since I've read The Pilgrim's Progress , by John Bunyan for myself. I'm pretty certain that the last time I read it, I was in high school. I'm also pretty certain that I read it because my mom had put it on my required reading list. However, my memory not being stellar in this department, I could be wrong. I just know that it has been a very long time. I was quite happy when Shonya at Learning How Much I Don't Know picked this title for the March Reading to Know Bookclub read. I had wanted to re-read it sometime this year and she provided me with the perfect opportunity of doing so! My own copy of the book was packed away being cleaned after our house was thoroughly smoked. I am happy to say that both of my copies of The Pilgrim's Progress survived the "little" mishap and are back on my bookshelves. (In fact, I'm happy to also say that I'm BACK AT HOME myself! We moved home yesterday!) This smoke-out was a great journey in and of itself (still not over in some respects) and so it was rather fitting that I read The Pilgrim's Progress in March. This is the allegorical story of Christian, who resides in the City of Destruction. The character of Evangelist tells Christian about the Celestial City and Christian is made acutely aware of his sins. Christian longs to be released from the literal burden of sin which he carries around on his back and so he begins a journey to the Celestial City where his sins will be removed and he will be able to live with the Lord of that land. Along the way he encounters many individuals, some of whom prove an encouragement on his journey and others of whom prove to be a great distraction. Christian is a pilgrim on a difficult journey which will lead him to a promised reward. Of course, there are a great many lessons for the Christian reader to pack away in reading this story. I could draw out any number of passages that spoke to me in one way or another. I'll just share one. I was struck by Christian's encounter with Worldly Wiseman. Wiseman tells Christian that there is an easier way to his destination that Evangelist first led him to believe. Wiseman tells Christian to go to the house of Legality who will help remove the burden on his back. Christian sets off in the direction of Mr. Legality only to be intercepted by Evangelist who helps steer Christian back towards the straight and narrow path. "Then Evangelist proceeded, saying, Give more earnest heed to the things that I shall tell thee of. I will now show thee who it was that deluded thee, and who it was also to whom he sent thee. The man that met thee is one Worldly Wiseman, and rightly is he so called; partly because he savoreth only the doctrine of this world, 1 John, 4:5, (therefore he always goes to the town of Morality to church;) and partly because he is of this carnal temper, therefore he seeketh to perfect my ways, though right. This Legality, therefore, is not able to set thee free from thy burden. No man was as yet ever rid of his burden by him; no, nor ever is like to be: ye cannot be justified by the works of the law; for by the deeds of the law no man living can be rid of his burden. Therefore Mr. Worldly Wiseman is an alien, and Mr. Legality is a cheat; and for his son Civility, notwithstanding his simpering looks, he is but a hypocrite and cannot help thee." Believe me, there is nothing in all this noise that thou hast heard of these sottish men, but a design to beguile thee of they salvation, by turning thee from the way in which I had set thee. " If I'm not careful, I could go on and on about how much truth is packed into those two short paragraphs. I think they stand alone without further need of dissertation but I did want to point out that way back in the 17th century (when this book was originally published) Bunyan was warning Christians of falling prey to the idea of being "simply moral." We aren't to strive to be "good people." Being good does not express a belief in the Lord Jesus Christ. Being good will not save you. It will help people to like you (and who doesn't like to be liked?!) but in order to be saved you must believe in the Lord Jesus Christ; you must believe in His death and resurrection. I also loved the mention of Civility which Bunyan tosses in there almost as an afterthought. Civility is often a mask for intolerance, despite what the person being civil is trying to present. The fake smile plastered on one's face is not an honest one. We should avoid wearing that mask and spending time with those who do. I can hear the argument that sometimes it is in one's best interest to be civil to get through a difficult situation. I personally am suspicious of civility because I've never known it to be honest. What I think we ought to strive towards is showing respect. Respect is quite a different matter. It requires calm honesty which is somewhat difficult to master. It involves sacrifice for another sometimes, which can be excrutiatingly difficult. I've come to like the word "respect" a great deal more in the last few years but when I say it I do not define it to mean fake smiles and half hearted attempts at communication. That last one is an interesting one to throw in there but I think it's key to showing proper respect. If you are showing respect to the President of the United States, for example, you recognize that he has more knowledge about the state of the country than you do because he has more access to more intel. (Showing respect doesn't mean that you agree with him completely or will even do all that he decrees to be right and good. It just means that you acknowledge politely that he has more intel and that he is in no way required to share that intel with you.) It never means you have to smile at him and nod your head pretending to agree when you absolutely do not. You may kindly tell him where you deviate in belief. We need to get the Highness out of us and take on a little humility, understanding that the Christian journey is a difficult one but full of great blessings and a wonderful reward. I think that's why I like The Pilgrim's Progress . It is certainly filled with more admonishment that 21st century Christians are comfortable hearing, but if we read it honestly we discover that Bunyan respects the reader enough to present truth. And in accepting that truth, we find strength and encouragement for our own journeys. The book is a blessing indeed! 1. 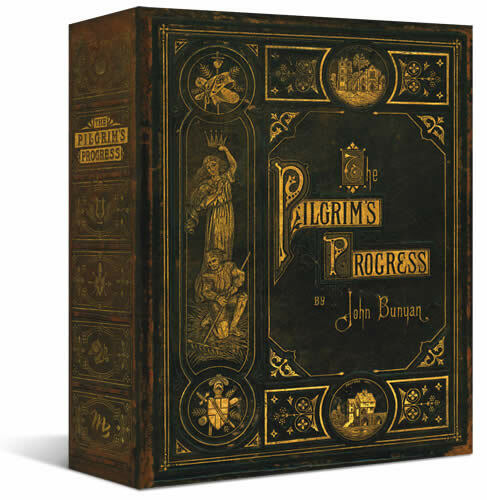 The Pilgrim's Progress has been translated into over 200 languages. 2. It has never been out of print since it was originally published in 1678! 3. John Bunyan wrote this book when he was in prison for holding religious services apart from The Church of England. At least twenty-one natural or man-made geographical or topographical features from The Pilgrim's Progress have been identified—places and structures John Bunyan regularly would have seen in his travels on foot or horseback. The entire journey from The City of Destruction to the Celestial City may have been based on Bunyan's own usual journey from Bedford, on the main road that runs less than a mile behind his Elstow cottage, through Ampthill, Dunstable and St Albans, to London. 5. The first film based on Pilgrim's Progress was produced in 1912. 7. It is considered to be a great piece of English Literature and is recommended to Christians and non-Christians alike, due to its historical significance. I haven't read this in a while, but one of my favorite parts was the escape from Doubting Castle. I'm so happy that you are back home! I haven't read this either, though remember seeing one of the movies when I was just a new Christian. But I'm determined to sometime in the next year. Don't ask me how (this being one of my favorite titles), but I completely forgot this book club was reading this. So, I didn't even start. I have read it (nearly as many times as I've read 1984, would you believe it), and I loved reading what you got out of it. I also would like to say that I'm always moved to tears around the Slough of Despond, and I'm continually amazed at Bunyan's clever depiction of law (sweeping the dirt) and gospel (cleaning it out). Since I read this more recently (College), I'm just going to follow the discussion and comment, rather than re-reading and posting a full review. Well written, Carrie. I'm glad to hear you are home again. I find it interesting that each generation seems to struggle with legalism. We never learn. Particularly in this age of cultural turmoil, the attraction of the new Pharisees is once again strong. (An acquaintance of a friend actually went on the record that forcing people to obey God's laws by government mandate was the equivalent of sharing the gospel. Yeah, my jaw dropped!) Bunyan lived in an era when forced conformity was the rule, and suffered as a result of his belief in salvation by grace alone. I really like that Bunyan understood that legalism is as much a part of the false philosophy of the fallen world as license. We tend to use the term "worldly" to apply to those who have different, "lower" standards than we do. But if you think about it, the Pharisees were "worldly" too - and Jesus directed his harshest words against them. Bunyan is clear about this, and we would do well to take the lesson to heart. I liked your digression on respect. I think that a lack of respect (and the contempt that goes along with mere civility) is the source of much of the incivility that we see these days. Disagreement does not mean that the other person is evil - which is what both sides of every issue seem to think. Also, as you know from our past conversations, I believe the lack of respect is the most important cause for the breakup of marriages. Bonus points for the use of a Princess Bride quote! As a final word, I would like to make a plug for Bunyan's other book, The Holy War. This book takes a completely different allegorical approach to the topic, describing the soul as a walled city, rather than a traveler. My library had to re-order a copy, so I just got it in my hands on Tuesday. I quickly realized it's the type of book that needs quiet reading time(for me, at least)! Hopefully, I'll be able to pull my thoughts together enough to post a bit later. I can tell that with enough concentration and a bit of studying, it could easily turn in to one of my favorites! At the moment, though, I'm finding it a bit intimidating. 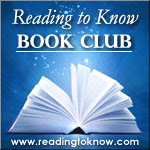 (Of course, before the book club, I didn't even know what it was about). Is it bad for me to say that I'm not interested in reading this book? I loved your snapshot of it and it sounds very meaningful and true. But I struggle enough just reading the Bible, so I don't think I could add this to my list. Also, so glad you are back in your own home again!! I read this book for the first time last year with my book club. So many spiritual truths! I also enjoyed the "sequel"--"Christiana" about Christian's wife and family and their journey. Well, I failed at my attempt to finish this one. Just not enough hours on my day (or willpower) for focused, disciplined reading. I am re-reading Little PP aloud to the girls for the first time (theirs, not mine), but I won't be finished with it for a whole yet. I am SO HAPPY for you that you're back in your home! Oh, yes, yes, yes! I LOVE this review! Isn't it such a great book with so many major points?! We could probably write a different post every day for a month focusing on different aspects of the book. :) Love your ruminations. The part about morality is especially meaningful to me today as last weekend I had a conversation with a woman who went on about how so many professing Christians (she doesn't think) are living "any better than she is" and she wishes people wouldn't try to push their religion on her because it's not like you "win a toaster" or anything. It was so sad. . .